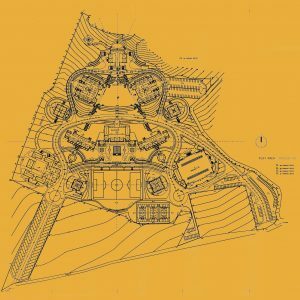 – The geometry of the meticulously designed elevations of the buildings were directly linked to the layout of the garden, including lawn areas, winding paths, borders etc. Major plantings are placed so as to observe the axial symmetry of the facades while at the same time concealing any external occasional distraction. 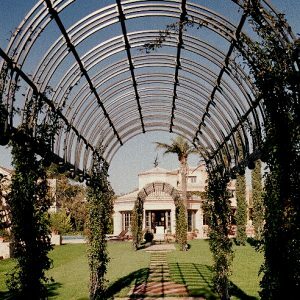 -The proposal included a unique variety of specially designed optional elements, such as classical iron pergolas, either straight or curved, placed at appropriate specified locations at the side but also centrally in the garden. – It also included a wide range of mostly Mediterranean plantings, trees with a long life-expectancy, including a variety of deciduous and evergreen oaks, cypresses, cedars, plane trees etc. – Colours of finishing materials in the garden are soothingly in tune with the mid toned vegetation that abounds, excluding white element contrast just as in the residences themselves. – The seasonally changing colour scheme included deciduous trees conveniently placed at the borders and orchard and upright shrubs and flower borders with seasonal colour interest as well as climbing plants with access to pergolas and other vertical masonry elements in the residences for fast-track, ‘organic’ integration of the garden with the residences. These result in a uniquely original environment in this garden, both classical-elegant and wildly natural at the same time, with optimal integration of the built with the natural to give the impression of a seasoned estate with accumulated patina and history. See more below for sophisticated lighting and a flexible system for a automated watering and supplying with nutrients for fast growth. 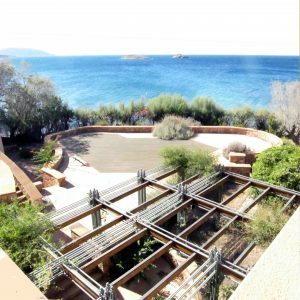 The sea-side garden at Saronis (2004-2009). A project in tandem with innovative modern interiors, structural improvements and major elevation face-lift, on small 50 year old attached residence and a much older existing structure in disarray quite close to the sea. A man-made small-scale organic sculpture around existing buildings and plantings. Discrete aesthetic concealment of existing buildings, with planted roofs of volumes, at the lower level, an organic secluded refuge in a prime sea-front location with a c.150m sea-front shoreline. Wood & iron custom designed prototypical pergolas in combination masonry fences with sculptural qualities. A quite secluded private garden was possible thanks mainly to the existence of old 80+ year old trees with massive trunks, most conveniently along the boundary of the area. As no new fence construction was allowed, old but effective existing fence constructions were retained to ensure privacy in the enclosed garden. Additional exiting plantings including pistachio and olive trees, noble laurus trees and various ornamentals including a canary phoenix tree in a quite central location, were respected and incorporated in the design. Old angelica plants pruned into tree shape were also quite characteristic. New plantings complemented the old in positions that did not interfere with axial symmetry in the layout of the garden as well as the most important sea views, which were also preserved. Stone masonry retaining walls, utilizing the quite versatile for garden soft Chios limestone from Thimiana, as well as hand-finished Chios marble paving and same five-cm-thick covering for most of the steps and retaining-wall coverings. The garden was subdivided in sections with quite different character. Densely planted areas in the periphery, containing also a paved path surrounding the property quite close to the extremities, areas close to the house for recreation, and terraces with sea-view and a far more extrovert character towards the sea and swimming pool. Parking shaded area for several cars with olive tree primary coverage by the entrance. The lower house was originally elaborately planted at the roof and remained easily accessible from the garden including a small terrace with a chess-board marble design for out-doors playing. The higher house had an iron pergola elaborately designed together with barbeque space and provisions at the roof, and also included dense plantings in the periphery. A study for an exemplary school campus located in a mildly inclined roughly triangular plot of c.80.000m2 at Spata Attica. The plot with its triangular pinnacle in the North close to a beautiful naturally planted hill and its wide base in the South is quite favourable. The design concept involved an isolated with dense peripheral vegetation school campus that benefits from an orderly symbolic layout from spiritual and intellectual activities at the very top in conjunction with the natural environment of Attica, and main educational activities below in a structured manner both symbolically and practically. Low-rise construction was legally mandated in this out of town location, but the concept of architecture with natural traditional materials, identifiable volumes representing separate classrooms, mostly with individual roofs, and windows and pergolas all enhancing human scale and being most familiar to young children, that rarely benefit from such an idealized environment in modern urban conditions these-days. The concept of the open campus for young children was quite suitable to the mild Attica climate, but quite strict functional requirements in terms of accessibility in all spaces from appropriate ramps, and quite specific issues of circulation, always in relation to the natural ground in the vast plot, were quickly resolved. The unfortunate long-awaited but unexpectedly unfavourable land-use restriction at the top part of the plot, against assurances already given to the owners, necessitated a non beneficial redesign, to adapt to the new unfortunate reality, bringing the buildings closer together, and resolving once again a variety of functional considerations. Finally important peripheral buildings were not implemented due to financial constraints, and basement spaces, appropriately lighted were provided for the activities that were originally planned to be most favourably housed in the eliminated peripheral buildings. It is quite unfortunate that the peripheral dense plantings for isolation, the architectural plantings that complemented the design of the buildings and had been planed from the earliest stages, as well as ornamental plantings were also sacrificed in the difficult financial conditions while the project was being financed. In addition the ground floor gardens, to be cultivated by the students in this innovative ecological environment were also sacrificed as the light-wells for the basement spaces eliminated this benefit. Thus although, implemented buildings, road network and parking spots for buses and cars, and the extensive paving network was implemented, the most critical complementary plantings were not.